I am Golda, your tour guide in Israel. Fasten your seatbelts; we are zooming back in time. Oh! We have landed in the Negev region south of Jerusalem ? but that city does not exist yet! Look! What is this vast crowd doing way out here in this wasteland? We meet our hosts: Moses the Lawgiver, Aaron the High Priest, Levi the Levite, and Bezalel the builder. They are appraising a huge, colorful tent with a sizeable area fenced off around it. Just look at the newly built Tabernacle, God’s dwelling, so stunningly beautiful with its gold and colorful furnishings. Bezalel, you and your skilled workers deserve much credit. Thank you Aaron. The whole congregation of Israel deserves credit. They generously gave gold, gems, tapestry, incense and spices, and we made it just as Moses ordered. I did not order the details, Bezalel; the Lord showed me the pattern on Mt. Sinai. The people gave so generously that I had to tell them to stop giving! Imagine! The entire congregation of Israel has arrived, Moses, every man, woman and child. Children of Israel, today is Yom Kippur, the Day of Atonement. Our High Priest Aaron will enter into the Lord’s Presence in the innermost room of God’s dwelling, into the Holy of Holies, to atone for all our sins, which are grievous. May God forgive us! May God forgive us! May God forgive us! Then, with a mighty roar, thousands of voices echo Moses words that have affirmed the foundation of the monotheistic Judeo-Christian faith throughout 3,500 years. Hear, O Israel! The Lord is our God; the Lord is One! You shall love the Lord your God with all your heart, with all your soul and, all your strength. Hear, O Israel! Hear, O Israel! Moses, we Levites brought the goats and bullocks, males without blemish. Everything is ready. May we visitors go with you into the courtyard, Moses? I’m sorry, Golda. You must here and watch. The courtyard is off-limits to gentiles. Come, Aaron; the moment has arrived. You will enter the innermost sanctuary of the Tent of Meeting, where God meets man, where the Almighty dwells with His people Israel. It is time for the burnt offerings, Levi. Prepare the fire on the altar here in the courtyard, while I bathe in this enormous brass basin, before I don my High Priest’s garb. Your garments surely are magnificent, Aaron; we Levites have them all ready. Just look at them! So meticulously made, with gold and a variety of jewels woven in, chains of pure gold, and a breastplate over your heart, carrying the names of the twelve tribes of Israel! Not to mention the bell, Levi. If the bell stops tinkling when I enter the holy place before the Lord, you will know that the Almighty has struck me dead. Drag me out with this cord. I hope not! I tied the sacrificial animals to the altar, Moses, and sharpened Aaron’s knife. Thank you, Levi. Now bring the fire, too. Are you ready, Aaron? I am afraid, Moses. You go. I cannot forget the charred bodies of my two sons. I don’t want the Lord to burn me up the same way! I might do something wrong, too. Do just as God commanded. Your sons approached Him without the sacrificial blood. Will you go with me, Moses? You must go alone, Aaron. Only the High Priest can enter the Most Holy Place, once a year. I offer the burnt sacrifices out in the courtyard, and lay my hands on the scapegoat to confess the sins of Israel. I then release it to carry our guilt into the wastelands, where God alone determines its fate. Then, I start inside, clutching the life-saving blood. I dare not step inside the inner veil without it; without the shedding of blood, there is no forgiveness of sin. Since I am also a priest, I can go with Aaron the High Priest into the first Holy Place, where I replenish the oil for the huge, seven-branched gold lamp that never goes out. I also replace the Bread of the Presence on the gold table; the bread is renewed daily. The moment has come, Levi. You stay here. You know what to do if the bell stops tinkling. I will pray fervently, Aaron, and not cease until you have come back out safely. I take a deep breath, and step inside the enormous inner veil that separates man from God. Oh! What I see dazzles my eyes ? the glory of God, the Shekinah! Few have seen it and lived! It shines above the most holy Ark of the Covenant. As soon as I regain my composure, I quickly burn incense before the Lord, so the cloud may cover the mercy seat, lest I die. Outside, we wait. The crowd is silent. Will the Almighty Holy One accept Aaron’s sacrifice? Inside, I approach the Mercy Seat. Careful now! I tremble so that I can hardly keep from spilling the blood. The Ark’s splendor leaves me breathless! The acacia wood is overlaid in pure, gleaming gold; inside it are God’s Ten Commands engraved in stone. Its two gold cherubs with outspread wings face the golden “Throne of Grace”, the only place on earth where man can meet God. Then, shading my eyes, I carefully sprinkle the blood on the Mercy Seat. First, the blood of the slaughtered bull, to atone for my own sins. Next, the blood of the slaughtered goat, to atone for the sins of all Israel. Aaron emerges alive, and several hundred thousand cheers ascend to heaven! Bezalel, everything in the Tabernacle and its furnishings have a deep symbolic meaning! Don’t delve too deeply into symbolism, Levi. The pillars are meant to hold the roof up. Oh! Aaron is raising his arms over the assembly, and the crowd has hushed. Let’s listen! The Lord make His face shine on you, and be gracious to you! The Lord lift up His countenance upon you, and give you peace! Lord, give us peace! Give us peace! 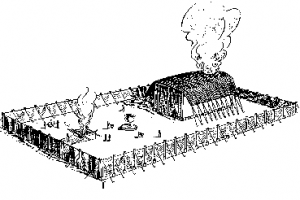 In what way did the Tabernacle, its furnishings and service point to Jesus’ atoning death, resurrection and ascension? Veil: Jesus’ flesh; He broke the barrier between God and man. He is either our door to God, or a wall. Why is it significant that Torah, God’s unbending Law, was contained within the seat of mercy? Hebrews says to “come boldly to the throne of grace”. Why was this not possible before Jesus’ death?